Inflatable kayaks have quickly become one of the most popular ways to explore rivers, lakes, and even the sea. They are incredibly easy to set up, suitable for all ages, and are also very cheap compared to their hardshell relatives. Many people want to try out kayaking, whether for leisure, exercise or exploration, but most don’t want to fork out large amounts of cash on a hardshell kayak they won’t use regularly. This is where an inflatable kayak shines. The K1 has been one of the most popular inflatables for a very long time, and once we got our hands on one, it wasn’t difficult to see why. We took a couple out one weekend to put them through their paces, and this is what we found. We took the kayaks out on both a calm and easy to paddle lake, as well as out into the sea. Most inflatables do well out in the sea, we have heard that they are sometimes prone to quicker degradation due to prolonged exposure to salt water, but we have yet to see any damage. The first thing we wanted to establish was how easy is the kayak to set up. How quickly can we get it from the shore into the water, the answer? Pretty damn quick. The high-output pump included in the kit made inflation a breeze. The kayak is also relatively lightweight, and is obviously more compact than a regular hardshell kayak, making it incredibly simple to store and transport. We can definitely see ourselves keeping it in the boots of our cars in case a spontaneous paddle is needed. If you plan on spending a lot of time out on the water, you will want to be comfortable. The K1, being an inflatable, is quite comfortable, you are basically sitting on a cushy seat. The floor of the kayak has inflatable I-beams. These beams not only add rigidity and stability to the kayak, but they all add to the comfort level. The kayak is relatively easy to control and to paddle with. It is quite small and very nimble. The size of it makes it easier to steer and turn, which is great if you are a first-time paddler and are inexperienced with control a kayak. The oar that is included does its job fairly well, it isn’t the best oar we have ever tried obviously, but for beginners and new kayakers, it will serve you well. If kayaking is for you, we are sure you will most likely upgrade the oar and even kayak at some time. Even though this kayak is inflatable, from what we have seen and experienced, it is rather durable. It has two separate air chambers, meaning that even if you get a puncture in one, the kayak will stay afloat for you to get back to shore. I scraped the bottom of mine on some rocks as we were paddling out, and I am happy to report that it barely did any damage, just some scrape marks. This is great to know, especially if you are out on a new stretch of water and you aren’t sure where the obstacles are. Like we mentioned in the beginning, many inflatables suffer wear and tear if exposed to too much sunlight and seawater. We did test this kayak out at sea, and we won’t know immediately how durable it is for that use. The kayak is fitted with a few extras, there is a cargo net which allows you to store pieces of gear that you may need out on the water. Two grab lines on either end of the kayak and the seat is inflatable and removable. The Intex Challenger K1 is on the lower scale when it comes to price. It is very affordable and the price will tempt almost everyone who is wanting to get into the kayaking scene. The price to quality ratio is spot on, and you won’t regret a single cent. If you are willing to spend more cash, the Advanced Elements AdvancedFrame Kayak is one of the best on the market. It is a hybrid inflatable, with a rigid frame and an inflatable body, but does come at a serious cost. 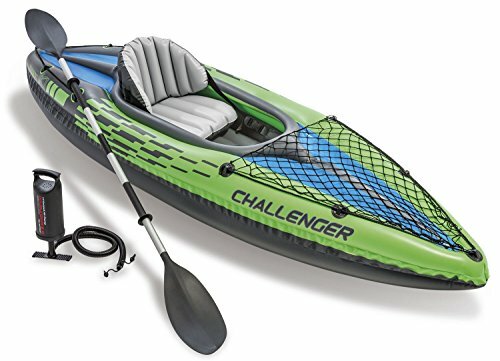 Overall, we will have to give the Intex Challenger K1 Inflatable Kayak a 4.5/5. It ticks every box for a beginner or starter kayak and adds a few itself. It is easy to use, easy to paddle with and can be used in various different conditions and bodies of water. If you are looking to get into kayaking, or you are wanting to buy your children a brilliant and safe first kayak, you can’t go wrong the K1. We highly recommend it.